Nationwide Drug and Alcohol Testing. We make it EASY. clients receive FREE first year enrollment! Whether you already have operating authority or are in the process of becoming a motor carrier, you need to comply with federal regulations that mandate pre-employment, random, reasonable suspicion and post-accident drug and alcohol testing. 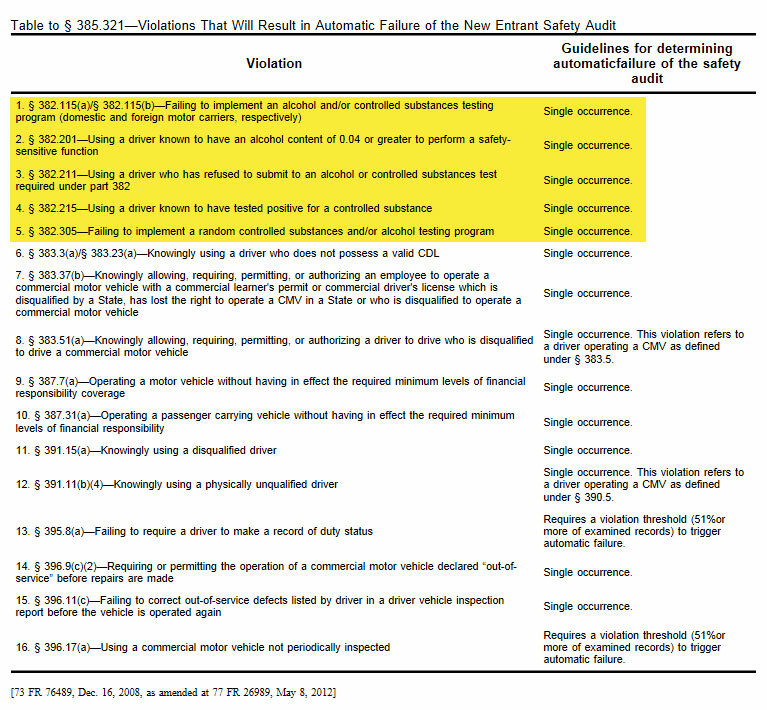 For new motor carriers under the Federal Motor Carrier Administration’s New Entrant Safety Assurance Program there are sixteen violations that will result in an automatic failure of your safety audit – five which are related to drug and alcohol violations (see table below). American Alliance Authority & Compliance offers compliance options exclusively through American Alliance Drug Testing. AADT has been providing nationwide drug and alcohol testing and consortium service since 1995. AADT specializes in providing employers, motor carriers and owner-operators convenient, cost effective support to facilitate regulated and non-regulated substance abuse prevention and random testing programs nationwide. AADT programs meet federal, state and industry standards. For motor carriers and owner-operators looking for a new TPA to administer compliance with drug and alcohol testing regulations, AADT has rates as low as $65 per driver (10+ drivers) with no out-of-pocket fees for random drug/alcohol tests.